The few Christians still holding out in Baghdad have found themselves on the receiving end of another barrage of intimidation. Posters appeared on the morning of 13 Dec. – a Sunday – near Christian places of worship with a message to Christian women to cover up, according to the London-based website, Al-Araby al-Jadeed. The Qatari-owned media, which says it aims to counter sectarian narratives, reported the messages were the work of the government-sanctioned “People’s Mobilisation” Shiite militias. 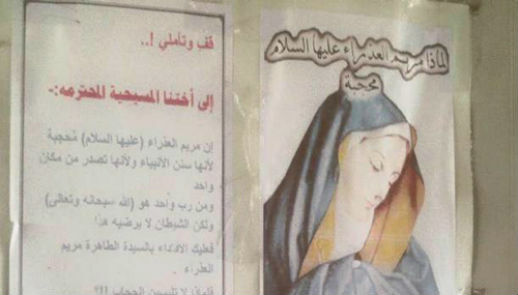 Posters of a veiled Virgin Mary appeared around the mainly Shia neighbourhoods of Karada, Kadhimiya, Zayouna and Ghadir – in areas where Christians still form a noticeable minority. Addressed to “honourable Christian” women, they said “The Virgin Mary was veiled, for such has been the way of the prophets” and included a call to “pause and think deeply”. Their version of the Madonna’s iconic picture, included, however, an extra wrapping of cloth to cover from the chin down, in line with the Shia dress code. Posters had also appeared in some areas of the city in November, Fides reported. Al-Hashd Al-Shaabi (“People’s Mobilisation”) is a paramilitary umbrella under which various Shiite factions operate. The Hashd (“mobilisation”) was formed by the Iraqi government in June 2014 as a counter-jihad to defend Baghdad, following the fall of Mosul to the Sunni jihadist “Islamic State”, or IS. “People, probably Shiite militias, pasted images of the Virgin on the homes of Christian families,” Louis Sako Raphael, Head of the Chaldean Catholic church, said on 15 Dec. Quoting eyewitnesses, Al-Araby al Jadeed claimed un-specified Shiite clerics were behind the offensive, which Christians have found insulting. “When you find those posters put up by militiamen right at your doorstep and next to your place of worship, it only means one thing: ‘You’d better obey, or else! 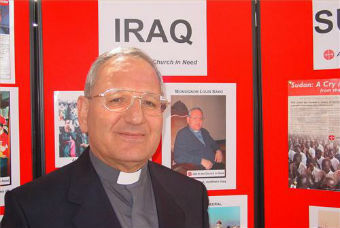 '” said Hanna Sliwah, a 47-year-old Iraqi Christian. “To again see their freedom to dress thus threatened is very worrying for Christians, let alone for the larger Iraqi society,” French newspaper Le Figaro quoted Sako as saying. The Chaldean Catholic Patriarch cited other examples of intimidation, such as the recent proposed legislation to ban the sale of alcohol throughout the country. In November, the Iraqi Parliament passed a resolution forcing non-Muslim children to become Muslims if their father converts to Islam, or if their non-Muslim mother marries a Muslim. A call for an “amendment” was only heeded after Christian protests. Throughout some of the Sunni-dominated areas of Iraq, Christians have had to flee, including in places where, historically, Christianity predominated. In 2014, IS overran Mosul, Iraq’s second largest city, and the surrounding Ninevah Plains to the north. So far, Christians have fared, by a limited margin, relatively better in Shia-majority areas of Iraq. “Apparently, we have no place here, either,” said Sliwah, pointing out that similar messages were displayed around Baghdad government offices. She said the instruction, like others, left little in the way of a choice. Iraqi Christian MP Joseph Sliwa dismissed the issue as an “isolated” incident. “Some posters appeared here or there. They were promptly taken down after the matter was taken up with the authorities,” he told World Watch Monitor. Sliwa said it is “unthinkable” the government, or the People’s Mobilisation, or even Shia clerics, could or should, be behind such incidents. Yet he acknowledged that issues abound. He said Christian women had been pressured to present photos of themselves in hijab to obtain passports. “Christian girls cannot go out to work, study, or even venture out in the streets without hijabs in cities across the [Shiite] south, such as Basra and Babel,”, Seliwah said, though he said this was due to social, not official, pressure. Two-thirds of Iraq’s Christian population fled the country during the chaos that followed the US-led invasion. From around 1,500,000, or above 6% of the population, in 2003, current estimates are that barely 0.8% still remain in Iraq. In June 2015, a member of Baghdad municipal council claimed that nearly 70% of Christian-owned homes in Baghdad were illegally seized during the post-2003 chaos. The result, he said, was that “it is possible that both parties [the original and new owners] can possess legally registered title deeds to the same property”. According to the NGO Baghdad Beituna (Baghdad Our Home), there have been more than 7,000 violations against properties belonging to Iraqi Christians in Baghdad since 2003. Christians have also repeatedly suffered attacks and kidnappings. For instance, October 2010 saw 58 people, including 41 hostages and priests, killed after an attack on a Catholic church in Baghdad. Long before IS came to gain such notoriety, Iraq’s indigenous Christians were declared a “legitimate target”. In November 2010, a series of bombings and mortar attacks targeted Christian-majority areas in the capital. Since 2003, church bombings and other attacks by both Sunni militants and Tehran-backed Shia militias have hit international headlines with increased frequency. Out of a list of 50 countries where Christians find themselves most pressured, Open Doors’ World Watch List places Iraq as number 3.